14 Ft Garden ladder, Tallman makes the best orchard ladders for sale at any price. 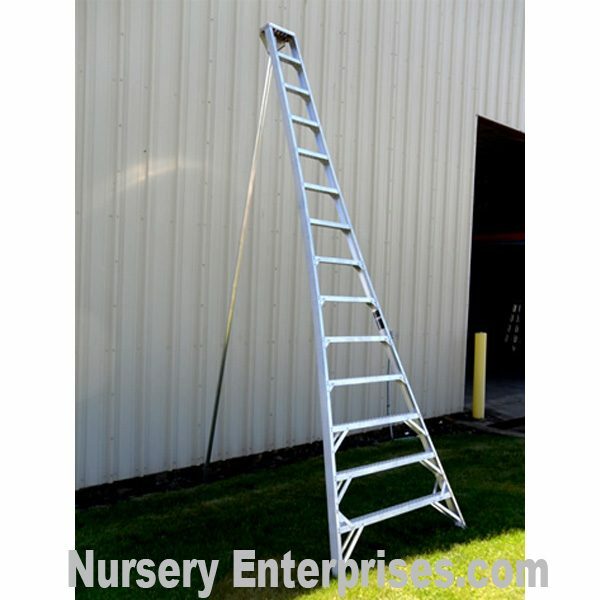 14 ft Fruit Picking/Hedge Cutting Ladders are the specialty for the Tallman Ladder Company. Lighter & better in many ways than Japanese ladders like Hasegawas. 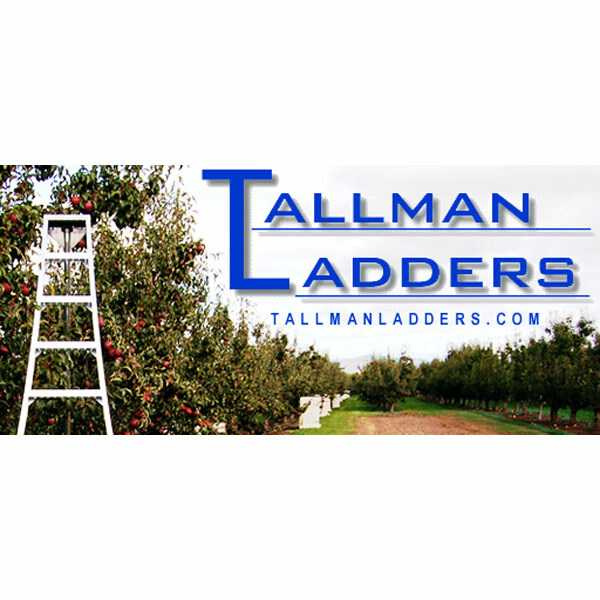 If you are looking for a 14 ft aluminum orchard ladder for general landscaping work or a tripod orchard ladder for pruning apples or cherries or any other tree, then Tallman Ladders are your best choice. 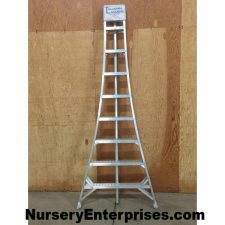 The 14 foot aluminum tripod ladder most preferred by Growers and Workers. The 14 foot Tallman tripod step ladder is built of lightweight tempered aluminum and designed for ease of handling, longevity, and proven for years of trouble-free service. Each step is braced for maximum safety and uniform flexing on uneven ground, and all parts have been interchangeable since 1954. Parts are readily available in the rare event that you might need one. Wooden ladders of this type have been available for years, but they are heavy (especially when wet), they leave splinters in your hands, and constantly need repairs. They swell in rain storms and became loose when they dry out, needing tightening several times a year. Not these. 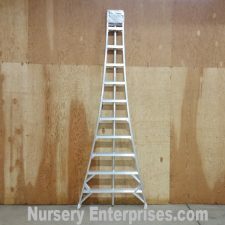 These 14 foot aluminum tripod ladders have earned the reputation as being the best quality and longest lasting orchard ladder on the market, at the most reasonable cost. If properly cared for, these ladders will last a lifetime. The 14 foot tripod ladder design is perfectly engineered with the third leg made so that it can be swung out and inserted between tree branches for fruit picking or pruning,…all kinds of projects where you need a ladder on the ground. Normal four legged ladders are just too unstable on uneven soil, but a Tallman Ladder will give you the stability and confidence to safely get the job done. They are crafted from the finest materials and workmanship, and the unique design makes a strong product for years of service. 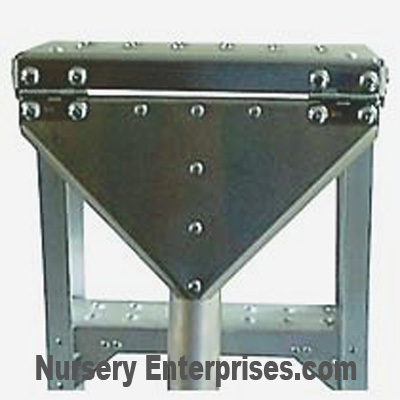 Specially Designed Strong Top Section with Rigid Steel Hinges and a Heavy Duty Tempered 3rd Leg. The specially made quality slip resistant steps, with dimples is built into every step on every ladder. SAFETY NOTE: Use the right tool for the job at hand. The Tripod Orchard Ladder is designed for orchard and landscape maintenance use only, where it is used on soil or turf type surfaces. The feet and pole of the Tripod Ladder do not have rubber feet, and cannot be used on hard surfaces such as floors, concrete, pavement, etc.. There also is not a spreader bar or chain between the main frame of the ladder and the third leg (pole) to keep it from spreading. All three points that come into contact with the ground depend on slight penetration of the turf or soil to remain stable. DO NOT USE on hard surfaces as slippage may result in injury. I use this ladder for more than reaching trees. 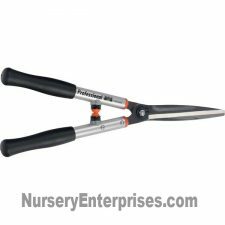 I also use it for reaching high trellis’s to intertwine my grapes and climbing flowers. The bottom really digs into the ground so you feel more sturdy on such a big ladder. Excellent product, very sturdy and stable. If you have a cherry tree, apple tree, pear tree, fig tree, orange tree, or any kind of tree for that matter, you need this type of ladder. No homestead is complete without one.